Rural laborers tending to manioc crop in Bahia State in Brazil's parched Northeast. A new United Nations labour report has revealed that more than half of the 52 million workers in rural areas of the Latin American and Caribbean region are in a state of vulnerable employment, characterized by lower wages, lower social protections and the prevalence to poverty. 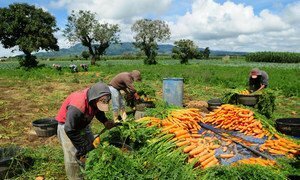 The UN International Labour Organization’s (ILO) Working in the rural area in the XXI century report (in Spanish), released in Colombia today, highlights that though productivity has increased in the countryside, large differences remain between the employment situation for urban workers and their rural counterparts. In simpler terms: around 56 per cent of workers are in vulnerable employment in rural areas as compared to 27 per cent in urban areas. “The rural area today is not what it was 20 or 30 years ago. We see great transformations: urbanization, less young people and older adults, a reduction in agricultural employment and an increase in nonfarm occupations,” said the Regional Director of the ILO for Latin America and the Caribbean, Jose Manuel Salazar, in a news release announcing the report. “Given that in the region the greater part of labour income comes from work, it is clear that the welfare and development of rural areas depend on what happens in the labour markets, income and employment conditions,” he added. According to ILO, one of the reasons for the gaps between rural and urban areas is because the countryside receives a lower proportion of public and private investment which translates into productive and social infrastructures. The report further notes that while unemployment in rural areas (3.1 per cent) is less than half of the in urban areas (6.9 per cent), it attributes this situation to the “need to work” in rural areas (due to high rates of poverty) and less access to education.The study, which includes data by country, is based on statistical information available from household surveys in 14 countries also documents a series of improvements in working conditions in rural areas between 2005 and 2014. One such area is health insurance coverage. However, still only 37 per cent of rural population have it in comparison with 62 per cent in urban areas. In addition, while there is a perceived increase in pension coverage, only 26 per cent of rural people are covered in comparison with 56 per cent from cities. Similarly, in regard to labour income, the report notes that despite having grown faster than in the urban areas, average incomes in rural areas (as of 2014) were equivalent to 68 per cent of the average in urban areas. Particularly startling is that the rate of rural poverty of 46.2 per cent, affecting 60 million rural people, is considerably higher than the rate of urban poverty calculated at 23.8 per cent. In the report, the UN agency also presents a series of policy recommendations, including productive development policies and investment in education and vocational training. In particular, it puts an emphasis on land tenure, investment in physical infrastructure, diversification and productive development with a territorial approach, and actions to connect small rural producers with worldwide supply chains. The report further recommends training rural workers and providing them with certification and accreditation, as well as training for entrepreneurs. In addition, it calls for reducing “a bias” towards urban areas in terms of public policies on employment and focus more on rural areas. A second group of policies included in the report relates to work and social protection: increasingly social security coverage, compliance with minimum wage policies, formalizing employment contracts (in a written form), strengthening labour inspection and promoting workers’ and employers’ organizations. Economic growth is not enough to eliminate poverty in rural areas of Latin America and the Caribbean, and governments need targeted policies and investments for agricultural development and correct historic inequality experienced by millions of people across the region, says a United Nations report released today.